There is a lovely smell coming through the window today, it must be from Katharinas beautiful Herb with Christmas Pudding card. Oh, bring us figgy pudding and a cup of good cheer! So if you want a chance to win this lovely Herb with Christmas Pudding Stamp you know what you must do. Just leave your comment and answer to the question below this post and who knows Santa may come early to you. The winner chosen at random by Random Generator.Org is 21 that is Lynda from Lynda's Scrappy Place well done Lynda can you e-mail us your address and Melinda Christmas Angel will soon be on her way to you, enjoy stamping with her. Oh what a cutie....love the snowman, and in answer to your question, yes all the christmas shopping has been done as of Nov 4th....first time ever. Woo Hoo! Ahhhh, endlich bin ich mal früh an*g.
So ganz abgeschlossen sind meine Weihnachtsgeschenk-Einkäufe noch nicht. Aber ich weiß zumindest, was ich noch kaufen will bzw. ich habe es bestellt. Das wichtigste aber habe ich: die Geschenke für meine Tochter! Not everything is done, but I have it all planned, just need to pick the gifts up. I usually think out gifts, then think where I can get them and finally go and buy them. The biggest problem are those that I plan to make, those I can sit and make through half the night before Christmas, lol. so cute! I'm not done yet but I don't have much to buy anyway. I love this card! Adorable! Nope, not finished my shopping either. I am a very bad procrastinator. I am almost done though. Love this card (and stamp ofcourse)! Gorgeous stamp, I'd love to win. Thanks for a chance. The only Christmas present I bought was for the Secret Santa exchange I participated in this year. Otherwise, we don't exchange Christmas presents, but I'm going to buy something for my little nephew for New Years. I JUST started my shopping!!! I am using the new baby as an excuse! I think that is acceptable... hahah. And that snowmancard, wow, what can i say? Always as amazing! Love the card. Does it count if I am done in my dreams? I need to wait for one more payday before I finish. It seems it always comes down to the last minute! What an adorable card. Of corse Herb helps too. Isn't he a doll? I just love Herb! Oh okay to answer today's question. Is my shopping done, No... But, almost, I have 3 more things to get and then I think I will be done.... I THINK... Of course the last day or two I always happen to find little odds for the stockings. I am not done yet, but don't have very much to buy and I can't find the ONE thing my grD really, really wants. (this week) LOL. Love the snowman and your card. Such a cute card again today. No I haven't finished my shopping yet but am nearly there. Gorgeous card ~ Love all the details!! What a cute image!! To answer the question sorryto say it is a big fat NO!!! Almost though hopefully this week-end!! I am done and completely broke, no room for any stamps or fun stuff! Poor me! I am so not done with all my shopping - I beginning to get worried! great card!..........I alwy's leave it late as I a terrible at deciding what to give! Does almost count? I have hit a road block not knowing what to buy for my hubby. It's the same every year. He's so hard to buy for cause he probably has it already. What a beautiful card! I have hardly started my Christmas shopping so I still have a long way to go yet. I didn't even start Christmas shopping yet, yikes! Ohhhh, I love Herb, and my Christmas shopping is not quite done. Two more gifts to buy, then let the wrapping begin!! hello, cute card again..and ..no..i stil have to do my christmas shopping..i work every day..and i don't have mutch time for shopping..
LOVE that snowman! Adorable card. I've barely made a dent in my Christmas shopping. Probably most of it will get done after I get out for Christmas Break on the 19th. Anyway, to answer the question....no way am I done. We have cut way back this year and are giving the nieces and nephews money (teenagers are too hard to buy for). I ordered a gift that is suposed to be delivered on December 24th!! YIKES~!!!! I really hope it gets here...I am supposed to be giving it on December 24th!! (I do this every year). I am almost done with my shopping. I just need the stocking stuffers and that is it thank goodness. I love the card again. Herb is the cutest. I havent even started and now I am really sick - isnt that great!! Love the card- like the use of the new nestibliites too. Ah the question- no, i still have two left to buy and am having a dickens of a time finding what I have decided to give. Should have started looking earlier. Ha! Heck no my christmas shopping is not done! hee hee! I am going shopping with my sister this weekend and hopefully will get it all done! :) Best wishes to all those last minute shoppers! Not all Christmas shopping done...have to shop for some more presents! Oh-Oh! I haven't even started the xmas shopping... Perhaps it's time soon ;) Lovely card! My shopping is not complete, however all but one of the hand made gifts are so I am VERY pleased with that!! Love that Herb stamp! So cute. I have almost finished shopping. I only have my Mom left. No not yet finished and still some to make too.But will get there, Just love the snowman, as here in SA we certainly don't see them. What an adorable card! I am in no way finished with my shopping! I'm usually much better than this too! I adore this stamp & would love to win it! No, I am not finished w/Christmas shopping but I'm really close!! Not even close to finished. Actually my girls are going to Grandma and Grandpas early so I can finish shopping before christmas. Love your card here to. Thanks for the chance to win some more stamps. For the first time ever I´m done with all the shopping except for one gift... And that one I can´t get until we get to Italy so... not much to do about that! The card is absolutely gorgeous! Keep my fingers crossed for luck! What a beautiful card! I am almost done with my shopping. wow that snowman look very cute. about the question: no I still need to do some christmasshopping. a few gifts, things to eat and some christmas lights(because they don't work anymore) and there is no christmas without some lights. Herb is so cute! Have a great day! Mit den Weihnachtseinkäufen sind wir fast fertig. I must buy present for my kids, for a friends christmas present I have finished - homemade. Das ist auch wieder eine wunderschöne Karte! Der Schneemann ist total süß! Mit den Weihnachtseinkäufen sind wir noch nicht fertig! Der Schneemann ist wirklich total süß! Tolle Karte. Ich bin in Sachen Geschenke ganz entspannt. Hab dieses Jahr recht schnell alles zusammen gehabt! Fab card! I love Herb! I'm making most of my Christmas presents this year, so I've managed to finish my Christmas shopping, as I've not had much to do...just got to finish making everything now! Lovely Herb card. I haven´t even started my Christmas shoping. I think there is still time, don´t you think? Thank you for the opportunity to win this stamp! Jedes Jahr nehme ich mir vor, nicht erst in letzter Minute die Geschenke zu kaufen, aber auch in diesem Jahr hat das nicht geklappt...bin noch auf der Suche. Die Herb-Karte ist wieder wunderschön, er ist sowas von süß!! Have a nice Wednesday all! No, I have not finished my xmas shoppings. I still need something for my children, but I know what I want to shop and thats more I expected. i have only got 2 presents so far, i know, better get my self sorted. ohh that's such a beautiful card. Herb is a real cutie. Christmas shopping was done on Nov 28 th. ! !YEAAH !! Another beautiful card, love the snowman. Nearly done my chritmas shopping, just need a few more. Beautiful card, no I haven't even been to the shops yet. Trying to make a few presents but will have to hit the shops very soon I think. Unfortunately no I still can't manage to find the right pressies. I have not even started! I have been spending most of my time with projects. Hopefully soon. Oh, this is so cute!!! But I was ready in time with my Sinterklaas shopping! Was für ein süßes Kärtchen. Meine Einkäufe habe ich abgeschlossen, aber und an sehe ich noch Kleinigkeiten die ich dann für liebe Freunde mitnehme. Oh, I just love the Herb Snowman stamps - I'd love to win him! Lovely card. As for my shopping I am surprisingly organised this year but I have not quite got it all yet. ooooooooooooooooh no shopping is not all done. Neither are cards all posted - panic! Having said that why am I sat at my computer looking at gorgeous art work - hmmmmmm maybe I ought to get up and do something. die Karte ist wieder so süss. Meine Weihnachtseinkäufe sind fast erledigt, ein paar Kleinigkeiten und noch einige Geschenke werde ich noch basteln. Gorgeous card, I love the herb stamps. No I haven't finished my christmas shopping yet, in fact I've hardly started. We are going back to England next week so most of it will get done at the last minute! The card is beautiful! And no I haven't even started! I like to wait until everything goes on a good sale! Yes I've done all my xmas shopping only got to wrap them all which I really enjoy doing. Gorgeous stamp! I feel ashamed to say I haven't finished. I've still got some of my hubby's presents still to get. I thought I was being organised this year but time is running away with itself! Gorgeous card. No, Christmas shopping still not finished and I am waiting for some internet orders to turn up as well! NO, still have some to do. Will have to do some online real soon! Ich bin schon fertig. Wie schön, mal kein gerenne in letzter Minute. Der Schneemann ist aber auch zu niedlich. Ich würde ihn super gerne gewinnen. Ich bin fast fertig mit dem Geschenke besorgen, nur noch zwei und dann sind sie komplett. I have about half of all the gifts left! Some to do and some thos shop!!! I have 3 gifts left to buy...I have ideas of what to get so all in all not too bad!! Now it's just down to the wrapping! 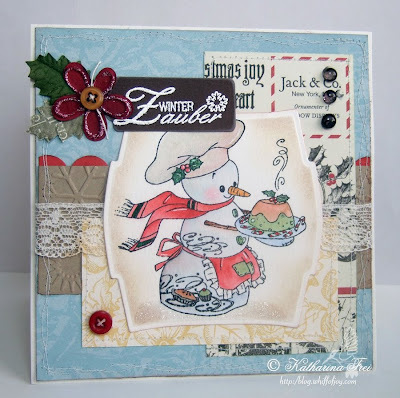 Such an adorable card and I love the snowman stamp! let's just say it's not quite done yet. Fabulous card, so cute! Answer to the question - just about!! Maybe a couple of little add to pressies to buy, but now the big job of wrapping them all!!! yes, my present's shopping is done! What a cutie and a very big & scary NO not started am hoping ot go one day next week and do the lot - Might need to put on my lits a foot spa!!!!! Still have some shopping to do. Ich habe alle Geschenke schon beisammen. I love Herb -he is so cute ! Is the shoping done ? NO ! help! haven't started ! Help! going up North to visit relies next Weds (Yikes !) so better get my skates on ! The back and Yikes again - will be nearly Christmas. On a bruighter note I have ordered the turkwey from M&S ! so at least we can eat christmas day! lol My daughter and the cats will be happy! Die Karte schaut so schön aus. Ich habe die Weihnachtsgeschenke noch nicht komplett. Wieder eine total schöne Karte!!! I'm off to do some shopping today. I've nearly finished my Christmas shopping & I'm quite organised this year (there will always be the last minute rush though lol. Love that snowman so my fingers are really crossed to get picked for this one!! I am leaps and bounds ahead of where I normally am. My husband and I go Christmas eve every year to an outlet mall to buy each others gifts so I'm never done until then. Finished Noooooooo wayyyyyy are we kidding ..Fun this time of year..
What a great card. I would love to play with it. I have all my shopping done and I am ready to go. Just putting the final touches to my DHs gift. Wow, eine wunderschöne Karte =)! Ich habe gestern die wichtigsten Einkäufe erledigt <3. Es fehlen nur noch Kleinigkeiten, die ich dazu schenken kann oder die an Freunde gehen. Ansonsten haben wir alles <3. This snowman is a keeper and I am going to try again to win! Christmas shopping is not done, I am doing it in slow increments- can't get done too fast or I will just buy more! LOL! No, I have not finished my shopping yet. No, I am not done yet...almost. I just need 1 more for my daughter, then for the cousins. I am enjoying these daily posts. And I absolutely love this card!! Lovely card en and the stamp of the snowman, so cute!!!. I did a part of my christmas shopping,But (like almost every year) i have to run at the last day. I barely started my Christmas shopping: I feel quite panic-stricken now! My son is looking over my shoulder and thinks Herb is really cute too! This card is so cute. Finished with Christmas shopping...NO! I haven't started yet! This year will be really easy though. We are doing gift cards and 1 present for the kids. Only cuz they are older and they really loved the idea last year. Thanks for a chance. Adorable snowman! Love the flourishes in his body! Have I finished my shopping ... heck no! Can you say we haven't even started! So many things have already been purchased (and given to them before Christmas .... not the cheap kinda gifts). Knowing that, all that's really left is a couple things and some stocking stuffers. Shopping is done, but I have a ton that I have to Make yet. Cute card btw. I don't have to do any shopping! We don't give presents at Christmas and I'll be away both days, so no food or other shopping necesarry! fabulous card, no, of course not, I hope to be almost finished tomorrow but have 2 of those very difficult/out of stock items I just cannot locate anywhere!! fingers crossed I find them before i run out of time! Your cards are wonderful and I was thinking how perfect they would be for tags for the presents I have made. Not finished yet -as I make lots of things - biscuits, cakes, jams, chutney, soap, things like that - and hope to be making cards (next year's 'challenge' so had better start practicing now! No Christmas shopping for me this year. Because I have a lot of Bill to pay wheeee. herb and his Christmas pudding is so cute! Love the dets like the candy canes on the plate. Very festive card! YES! I am done! No more shopping! :) Not everything is MADE yet, but shopping is DONE! The card is gorgeous! I have finished my Christmas shopping but I now have to wrap all of them! This is a very sweet card. Yes, I think i have finished my shopping, but there is always that one thing you forget about, so fingers crossed. Die karte mit dem Schneemann ist toll. Mit dem Einkaufen sind wir noch nicht fertig. die karte ist mal wieder klasse und herb ist einfach zu niedlich! Great card! No I haven't finished my shopping yet but am nearly there. Oh, ich bin gut dieses Jahr und habe im Prinzip alles zusammen. Great card, love the snowman. Christmas shopping - never finish it until the shops are shut on Xmas Eve, every year I promise myself I will be more organised! LOL. Nowhere near finished. In fact only just started! I'm normally all done by now. yes, all my shopping is done and I did it all online so I didn't even have to venture out into the cold! Great cards as always! Yes! I shop my last one today!! Christmas shopping?!? Heck I only just started yesterday!! That snowman cook is delicious!! Christmas Shopping lol, yes I am done I think lol, just a couple of bags of sweeties not for the kids either lol and then finished, must get out there and buy my daughters birthday pressies shortly before they sell out in the christmas rush!. I love the card and the idea behind it. Holiday baking has long been a family tradition and it's such a happy memory. I'm nearly done with my shopping. Just a few more thing! Eine Traumhafte Karte das Motiv ist ja eigentlich alleine schon ein Traum! Unfortunately I ran out of money so I have not finished my Christmas shopping yet. Great card Katharina. Thanks for the chance to win. Yep, all done. I started early this year (some things I have since September). The last thing (parcel for my family in Europe) went out on Monday! Thanks for the chance to win such an adorable stamp! I think herb is really cute, and a good cook! I haven't finished the Christmas shopping, got a few presents to get yet. I start buying in the sales after Christmas too but I am never done, but I did get a book today to go towards my hubby's present. This year we are going with just one gift for everyone, so my shopping will be done fast, when I get around to it :) Merry Christmas to everyone! Was meine Weihnachtseinkäufe betrifft bin ich mitten drin. well, I haven t started christmas shopping yet, but will do it in one afternoon, none of my friends are crafters so will buy them craft kits, might make them interested !!!!!!!!!! what !!! I can do all my shopping in one shop , get my essentials too while I am there !! Brilliant card! Love it. I'm late this year with christmas as I nearly was with this comment. Thanks for this event. Beautiful card!! I am no where near done with Christmas shopping.... Slacking here! !